a tongue-in-cheek Financial Statement drawn up by my paternal grandfather, Andrew Maitland Jarvis in 1945. 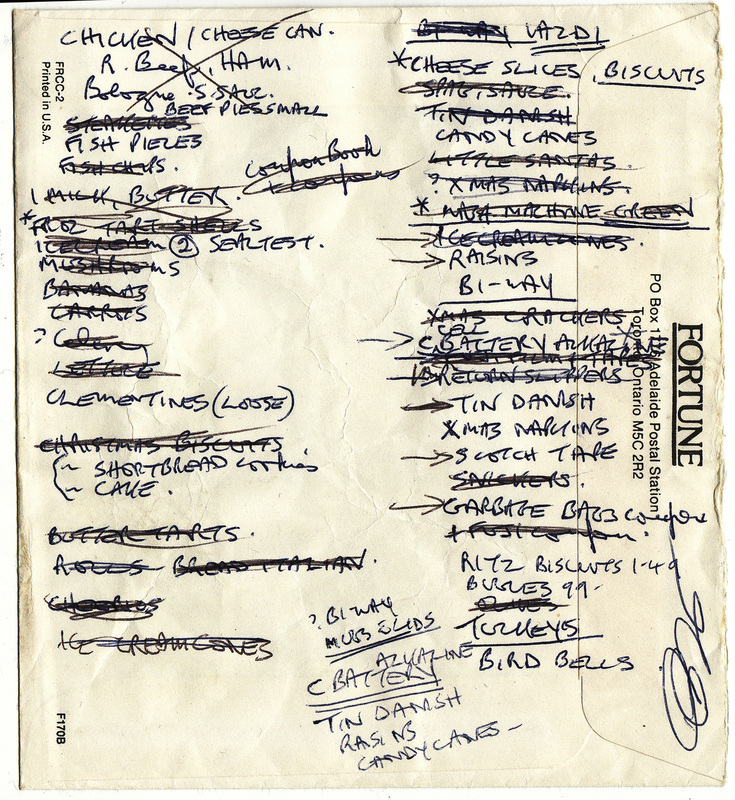 At the centre of the piece is the shopping list made by my mother as Christmas approached. It shows her strength, a grim holding-on, at a time when we were devastated to see my father sink lower and lower from the effects of what was revealed in the autopsy to be glioblastoma multiforme, very aggressive tumours with poor prognosis. My mother was asked to sign a surgery consent form. My father made a gesture to her, with a mischievous smile, which she interpreted to mean that he wanted to write something, too. He made some tiny scrawls on the back of her list, which I’ve incorporated into the consent form. 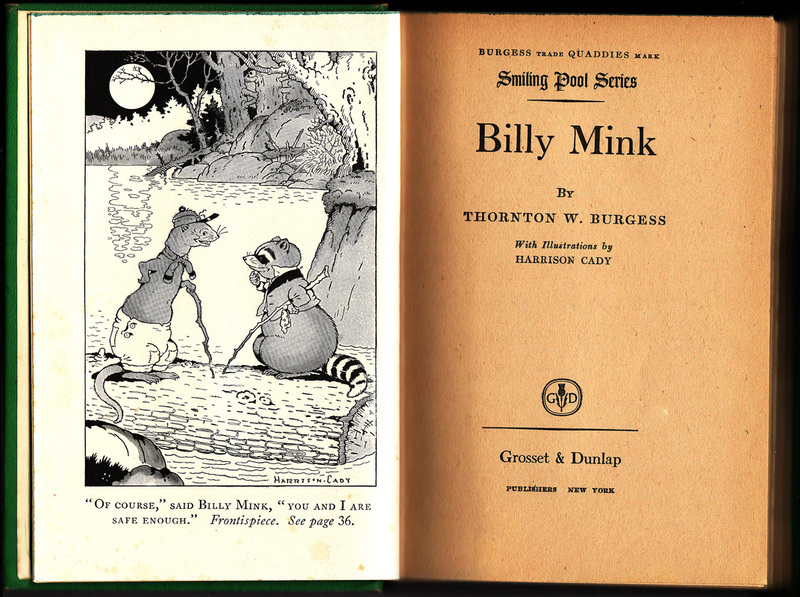 It took my mother some time to realize that he had written “Billy Mink”, his father’s pet name for him, taken from the Thornton W. Burgess Green Forest children’s books. My parents met in India at the end of WWII. My dad, Bill Jarvis, was a radar operator with the RCAF, from London, Ontario. My mother, Sheila Cranch, was a nurse from Great Britain serving in the Queen Alexandra Imperial Military Nursing Service Reserve. They married on July 21, 1945 in Bombay six weeks after they had met as their units were being de-mobilized. My mother and her younger sister Dana had been raised by their mother in straitened circumstances following the untimely death of their father who was gassed in WWI. Her studies, on scholarship, at art school were interrupted by the war and she dutifully struggled through her nurses’ training. Her family was absolutely aghast at young Sheila impetuously marrying a Canadian in India. At the bottom of Victoria Hospital 1991, is my father’s scrawled signature and underneath that is the beautiful handwritten script “Billy Mink” is my grandfather’s writing. Billy Mink was my grandfather's pet name for my father. 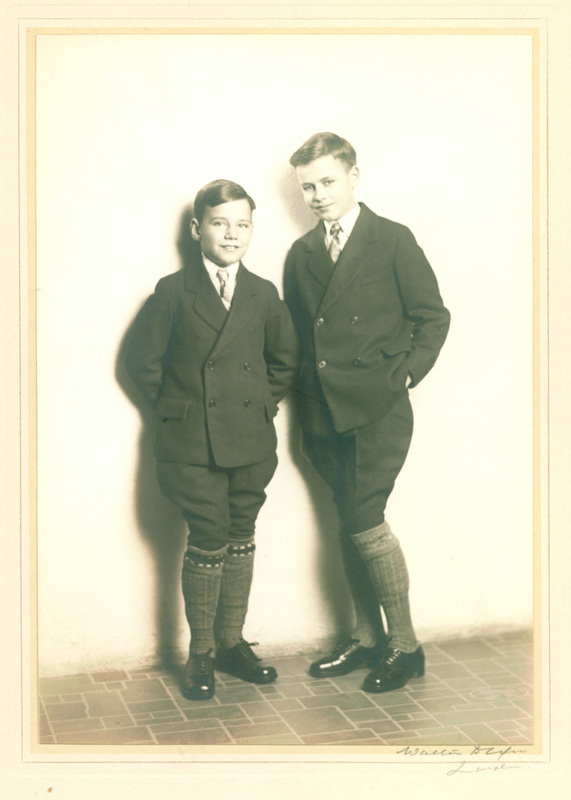 "Billy" [on the right] with his brother "Jerry Muskrat"
Victoria Hospital 1991 won a Jurors' Award at Fibreworks and was purchased by the Cambridge Galleries. 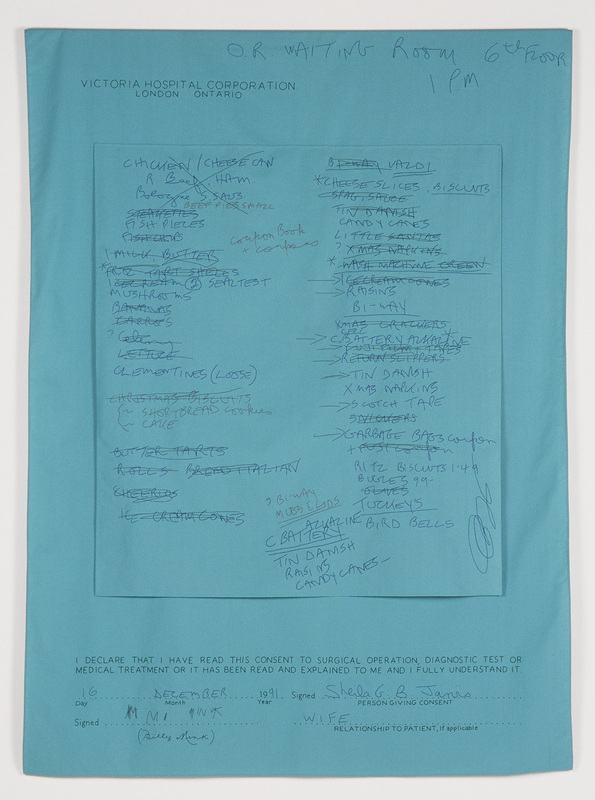 My embroidered work, Victoria Hospital 1991, which I completed in 2001, carries on a London, Ontario tradition. 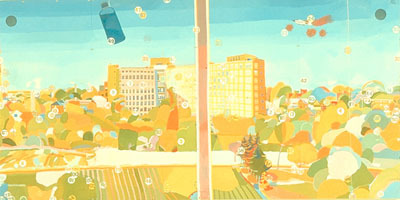 Greg Curnoe and Jack Chambers painted views of Victoria Hospital around 1970. Curnoe's studio on Weston Street has a view of the hospital. Second Series (February 10, 1969 – March 10, 1971) is oil, rubber stamp and ink, graphite, and wallpaper on plywood (with audio tape) and is in the collection of the National Gallery of Canada.